Dalia Judovitz has spent a lifetime studying questions related to the nature of knowledge and how it informs our understanding of ourselves. This spring, as she finished her last semester in the classroom, her teaching has proven to connect with students, inspiring their interest in French philosophy and literature to prompt even more questions: What is the nature of who we are? What makes a happy life? Her courses such as “The Art of Living” and “Cultures of the Self” have encouraged her students to grapple with these ideas. “I want to nurture that way of learning in my students, so that learning comes alive for their entire lives,” says Judovitz, National Endowment of Humanities Professor of French. She joined Emory College of Arts and Sciences in 1988, after teaching at the University of California, Berkeley, at a time when Emory was separating French and Italian into its own department, instead of being included under Modern Languages. 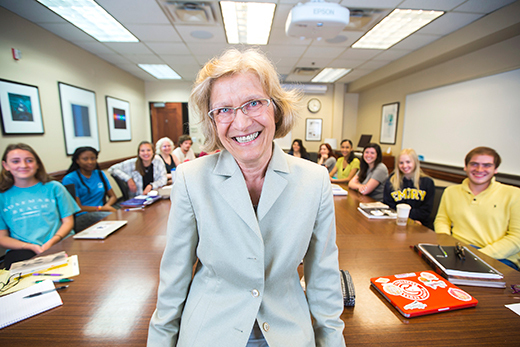 After devoting the next year to research, she will officially retire from Emory in fall 2018, leaving behind a long legacy of teaching, scholarship and service. Judovitz served 10 years as chair of the Department of French and Italian, building up the department with an international team of scholars and a focus on interdisciplinary teaching. “We still teach French literature and culture but do it with consideration for philosophy, linguistics, the visual arts, psychoanalysis and more,” she says. In her own courses, Judovitz uses French theory to encourage students to think about living their best lives by exploring texts such as Michel de Montaigne’s “Essays.” Writing during the late Renaissance, Montaigne argued that our “great and glorious masterpiece is to live appropriately.” His call for self-cultivation relied on experience rather than reason alone and implied a recognition of the body’s role in determining knowledge and the meanings attached to the self and its relations to the world. Reprising ancient stoic and epicurean traditions, Montaigne opens up an understanding of the self as an ongoing process of self-formation and composition, one that stands in opposition to René Descartes’ later definition of modern subjectivity, “I think therefore I am,” that gave rise to the mind-body dualism. Engagement in this ethical endeavor of “self-writing” requires, as the French theorist Michel Foucault contends, learning how to read, write, interpret and compose not just texts but also the actions and conduct of our lives, says Judovitz. “She brought me to understand philosophy not as a detached, purely academic discipline, but as something that can refashion your entire relationship to yourself and the world,” says Benjamin Crais, a film and comparative literature major who graduated in 2016 after taking Judovitz’ “Art of Living” course. Judovitz has applied the practice of constantly crafting and challenging herself to her work. She has authored five books and has a sixth coming out this fall entitled “Georges de La Tour and the Enigma of the Visible” with Fordham University Press. Camila Reed-Guevara, a sophomore majoring in classics and philosophy, initially planned to use Judovitz’s 300-level French course on subjectivity just to get the language credit. But the professor’s training to look more closely at what she sees, and to try to find a deeper interpretation, resonated enough that Reed-Guevara sought independent study with Judovitz this spring. It does not surprise Judovitz that students have responded to her teachings that way. She has found Emory students to be eager for ways to challenge their thinking because they recognize that a more theoretical understanding will open up the world to them, regardless of what they go on to become. French theory, she says, is particularly interesting for people who want to ask why and how we come to think as we do — and challenge any certainty. She sees that in Emory students and in her colleagues who have encouraged her interdisciplinary style of teaching.